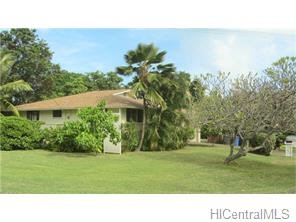 Rarely available kalaheo hillside home located just blocks from world famous kailua beach. Corner lot with over 10,000 sqft. Over 200 sqft patio off of the master bedroom and a private back yard with in-ground salt-water pool, water slide and shaded sitting area. The original configuration is a 3 bed/2 bath and includes an open floor plan with solid oak flooring. The partially enclosed area of 418 sqft has been converted into enclosed laundry/utility room and a private guest studio with its own bath. Solar water tank and roof have been recently upgraded.